Spirulina is a blue-green algae that’s naturally found in the world’s purest and finest freshwater sources, as well as under ideal climatic conditions. With its staggering number of benefits, this miracle supplement is often referred to as “the world’s most complete food”. 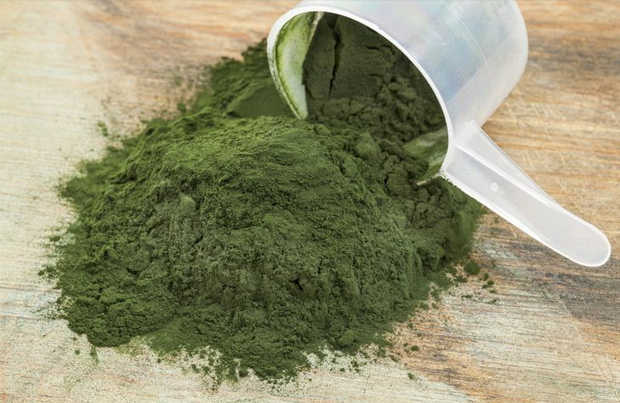 One of its most notable benefits however is the fact that Spirulina is the richest beta carotene food known to man, targeting different sites in our body to enhance antioxidant protection. Boosts overall health and the immune system. Reduces symptoms of menopause and PMS as well as relieving menstrual pains. Packed with calcium for strong bones and muscles. Helps improve the digestive system and prevent constipation. Has a natural detoxifying effect on the body. Source of Vitamins B1, B2, B3, B6, B9, C, D and E.
High in vitamin B12 which is essential for vegetarians. Contains potassium, chromium, copper, iron, magnesium, manganese, phosphorus, selenium, sodium and zinc. Helps alleviate and prevent allergies while also reducing the risk of allergic reactions. Exceptionally high in protein – more than beef, poultry and soya. A recognised anti-ageing supplement that not only prevents signs of ageing, but maintains mental and bodily health. Promotes healthy nerve function and builds tissue. Acts as natural cleanser that flushes out toxins like mercury and heavy metals. Boosts stamina and muscle mass – ideal for athletes. Curbs hunger and keeps you feeling sustained for longer. Restores energy levels and prevents fatigue from kicking in. Reduces the risk of cancer and heart disease. Helps lower blood pressure and maintain normal sugar levels. Reduces stress levels, depression and anxiety. Improves memory and promotes a healthy sleep cycle. Enhances hair, skin and nail health and is ideal for use during pregnancy.